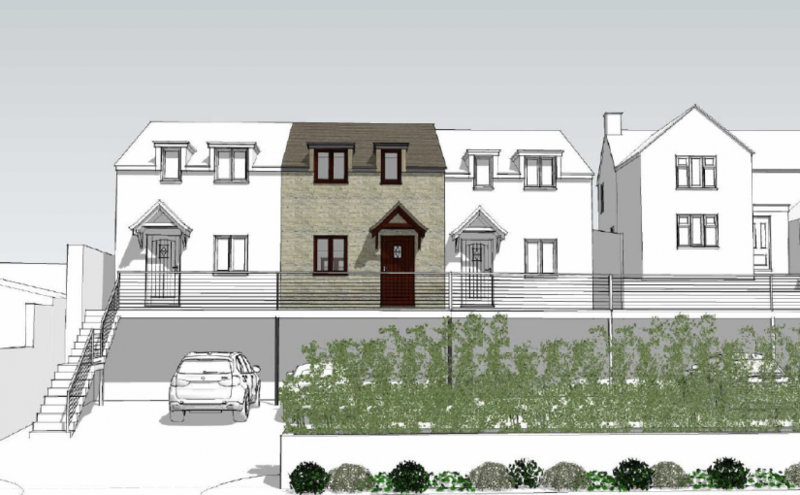 These three terraced houses are to be constructed in this attractive, elevated position in this popular cul-de-sac close to Dursley town centre. The accommodation is to be fitted to a good standard with high insulation properties and attractively laid out accommodation comprising entrance hall, leading to kitchen with a range of built in appliances, cloakroom/wc and good size living room with French doors on to the rear garden. On the first floor there will be three bedrooms with master having en-suite shower room. In addition there will be a family bathroom/third wc. The properties will have two parking spaces to the front of the properties. Having wash hand basin and low level wc. Having double glazed French doors to rear overing garden. Having a range of modern wall and base units with built-in appliances (to be discussed). Having low level suite comprising wash hand basin, low level wc and shower cubicle. Having double glazed window to rear. Having double glazed window to front. To the front of the property there is a shared parking area with two allocated parking spaces, steps lead to either side of the terrace with walkway giving access to the front. The rear garden will be enclosed by fencing and will be laid to lawn.